One of the things I needed to do recently was move some objects from one schema to another. I wrote about moving an object between schemas recently, but another part of that process was finding the objects to move. 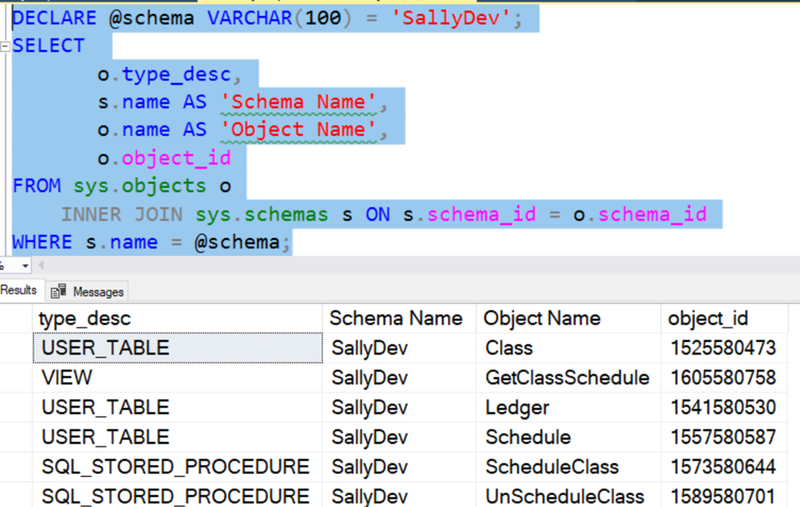 This is a quick post on how to find the objects in a schema. To start, here are a number of objects in a test database. I can see my SallyDev schema, so I know I’ll query this DMV. 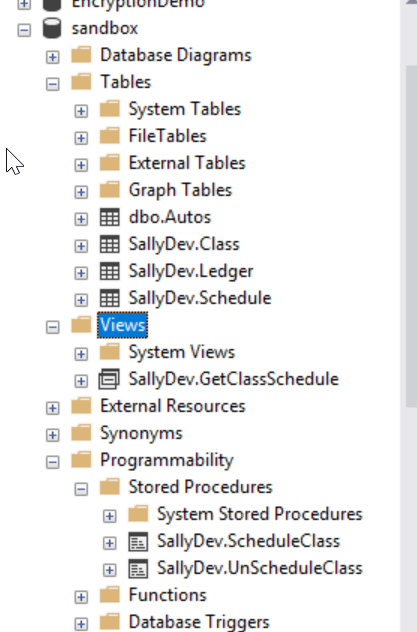 The other information I need is the object data, which is in sys.objects. I query that for the various data I want, but I want to limit data by the schema. 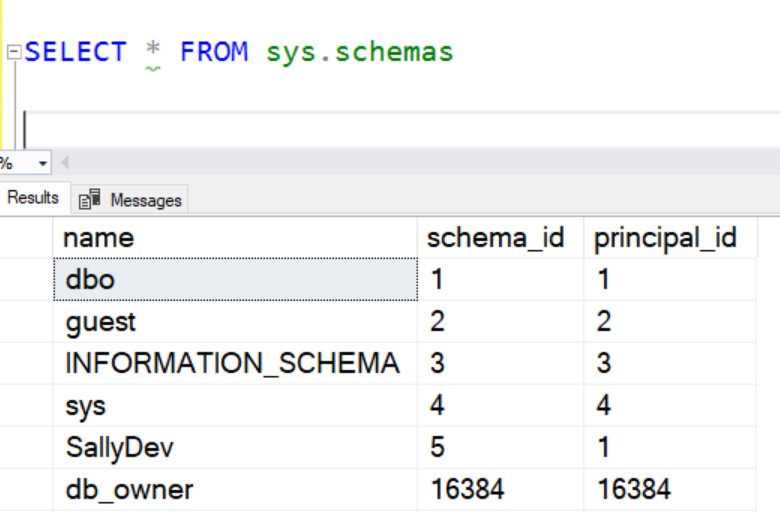 In sys.objects, there is a schema_id, which is the data I’ll join with from sys.schemas. I can execute that and I’ll see the objects I need. This was a post related to the one on moving objects and I wrote this write after that one. It was only about 5 minutes longer to put this together, and it gives me a script I can easily search for on my blog if I need to do this task. Once again, a quick and easy way to show some skills, practice explaining something, and get some knowledge stored for my own reference. This entry was posted in Blog and tagged SQLNewBlogger, syndicated, T-SQL. Bookmark the permalink. Thanks. But I have more use of a script which crawls all the databases on my instance. Interesting. Is this because you have a number of copies of the same database for different clients/uses? Or you use the same schema over and over for different databases? I could have copies, but no. I use schema more for ordering/naming purposes than for security reasons. And I split things across databases based on their nature (example: staging tables in one, analytical results in another, utility procedures in a third) – and then I use schema to weave them together: All things connected to a project gets the same schema with a project “name” – Then it is far easier to clean up in the databases afterwards – and I still get to collect reusable stuff in plain sight across work tasks. Interesting. That would probably make a great series of blogs or articles if you wanted to write about it. Btw. I just realized a typo in my script above: I only show @Result if @@ROWCOUNT > 1. It should say “> 0” of course.